In recent years, modern dentistry has made tremendous advancements for patients with missing teeth. Before the widespread use of dental implants, patients who suffered from tooth loss had limited options. Their options normally consisted of dentures or bridges. Dental implants provide patients with tooth replacements that resemble actual teeth and function better than dentures. Dental implants are essentially replacement tooth roots. They can be permanently attached to your jaw or they can be removable. What Are Some of the Advantages to Using Dental Implants? 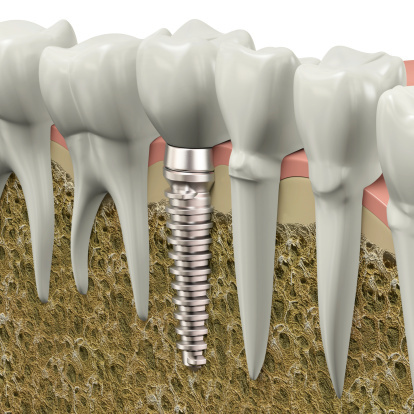 Dental implants fuse to your bone. This allows them to feel and function just as your real teeth do. Dental implants don’t impede your speech as dentures tend to do when they slip out of place in your mouth. In addition, implants are more comfortable because they are fixed to your mouth permanently, eliminating the need for removing your dentures and using sticky adhesives. Another advantage to this form of tooth replacement is that you can care for your implants the same way you care for your natural teeth. There are no special techniques or procedures you’ll have to learn. They can last a lifetime if you care for them properly! Dental implants also have a high success and satisfaction rate. Who Makes a Good Candidate for Implants? Patients with healthy gums and a healthy bone are great candidates for dental implants. Additionally, good candidates for this procedure need to follow a thorough oral health care regimen. People with diabetes, heart disease, and gum disease may not be ideal candidates for this treatment.